Last night we ordered dark chocolate fondu after chowing down on Shabu Shabu, a Japan style hot pot, to complete dinner. 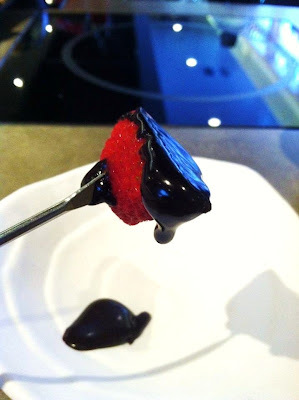 I find strawberries with slight tartness pair extremely well with dark chocolate. For a while now, I have been entertaining the idea of a fondu partying. After dinner last night, I feel motivated to actually do something about the idea. Fondu is a great party food idea because friends can hang out and snack on little bites. For a party, I would do both cheese and chocolate fondu pots. This way, we can have both sweet and savory. Rice crispy is just good with chocolate. I didn't think pound cake will be good but it is rather delicious. Of course marshmallow is a must. I can imagine toasted marshmallow will be even better. What is your favorite food and style for fondu?? WOW.... love, love chocolate fondue!!! Yum--time to pull out my fondue pot! These all look so yummer, makes me hungry now. It´s good to know you had a great time. Love fondu. But we don't eat it much. I like going to the Melting Pot. Love the dessert fondus. I don't like chocolate, but I love traditional Swiss fondue. The secret to success is using real kirch, nothing else will work because only kirch will give the extra kick to the pot, otherwise it is just melted cheese. Love it in the winter!